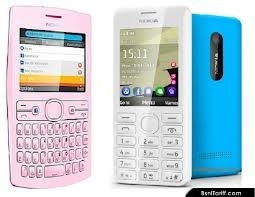 Leading Mobile maker in India Nokia has Launched Two New mobile phones “Asha 205 and Asha 206” with dual sim feature. Mobile users gradually increasing especially users connecting to social websites like facebook, twitter etc for making new friends. Nokia gives users pre-installed apps like eBuddy chat, twitter and Facebook, popular email accounts (Gmail), 40 free games from EA. Nokia Asha 205 will be available in Cyan, Magenta and Orange colors, 2.4 inch display, 2G connectivity, Bluetooth, VGA Camera and 11hrs battery backup. Nokia Asha 206 will be available in Cyan, Magenta and Yellow colors, 2.4 inch display screen, 2G Connectivity, Bluetooth, 1.3 megapixels, pre-installed apps, Runs on Series 40 OS, Dual Sim, Nokia Xpress Browser, 90% data transfer. Both phones are the first to feature Nokia’s new Slam Technology, lets users share files over Bluetooth without first having to pair their devices.